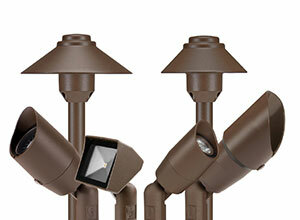 Vista Professional Outdoor Lighting unveiled its new V-Series landscape lighting collection. Constructed of thick-wall, die-cast aluminum, the collection includes six models — four up & accent lights and two path lights — all available in five standard finishes and 13 premium finishes. The 2216, 5006 and 5014i Up & Accent models feature tempered, shock-and-heat-resistant soda-lime glass lenses, as well as tool-free, rotatable shrouds for easy fixture entry and aiming by hand. The 5105 Up & Accent has a bordered, high-impact, tempered lens with a high-performance anodized aluminum reflector. All four Up & Accent models have injection-molded, reinforced polymer knuckles with half-inch NPS and silicone o-ring gaskets for a reliable seal. The 2216 and 5006 include Vista’s high-performance LED 4.5-watt or 5.5-watt MR-16 lamp in 15-degree, 25-degree, 36-degree and 60-degree spreads. The 5014i model has integrated, advanced chip-on-board (COB) LED technology available in 1.5 watts, 2.5 watts and 3.5 watts with outputs up to 400 delivered lumens available in 25-degree, 36-degree and 60-degree spreads. The 5105 also features the same COB LED technology, but in 2-watt, 3-watt and 4-watt options, all with outputs up to 400 delivered lumens. The collection’s 2265 and 2267 path lights consist of thick-wall, die-cast aluminum shades and stems with half-inch NPS and textured polycarbonate optic lenses specifically designed for even light distribution. Featuring a lamp life of 30,000 hours, both models also include Vista’s new high-performance T3 COB LED lamp running at 2.5 watts with a 193-lumen output.